We’d love your help. 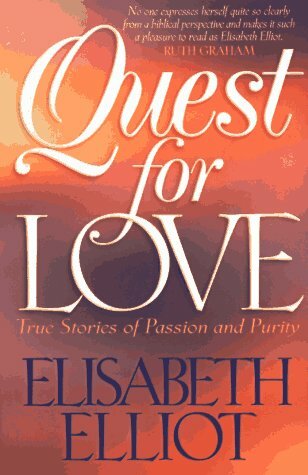 Let us know what’s wrong with this preview of Quest for Love by Elisabeth Elliot. Quest for Love tells true stories of people who gave their lives to God and how they met their spouses. The message is clear: Put God first and don't worry about "hunting" for a mate. God will give you what he knows is best for you at the proper time. Each chapter has discussion questions. To ask other readers questions about Quest for Love, please sign up. how can i read this book onlin????? where can i have an ebook/pdf copy of this book? thank you! one of Mrs. Elliot-Gren's best. She tells true stories of several couples who trusted God for the perfect mate and were not let down! Since I have been married for over 25 years, why would I read a book like this? The one main reason is to learn more about faith. It takes faith to live a life that the bar is raised in such a book like this. It is not about do's and don'ts, but more about attitude of the heart, a heart after the Lord and His will for your life, and the blessing that come with it. Regrettably, many believers and non believers alike feel judged when people choose to raise the bar in their own lifes. When one live Since I have been married for over 25 years, why would I read a book like this? The one main reason is to learn more about faith. It takes faith to live a life that the bar is raised in such a book like this. It is not about do's and don'ts, but more about attitude of the heart, a heart after the Lord and His will for your life, and the blessing that come with it. Regrettably, many believers and non believers alike feel judged when people choose to raise the bar in their own lifes. When one lives a life of the word, others are going to feel judged because the word is living and cuts to the heart. I pray in my own life, that I live more according to the word and not be worried about what others think. I don't believe this is impossible, because with all things, with God, it is possible and the stories reflect that. I hope men and women read this if they are serious about following God's will for their life. It is based on scripture and you see God's hand on each if these stories. Elisabeth Elliot is one of my favorite speakers (on podcasts mostly but nonetheless my favorite) and after reading this book I might even consider her to be a role-model. I read her other book Passion and Purity after hearing her speak a few times and was very touched by her utter devotion to Christ. This book was the same. Her commitment to God and her devotion to submitting her life to God entirely and her urge for other Christian women to do the same, is very present throughout the book. The Elisabeth Elliot is one of my favorite speakers (on podcasts mostly but nonetheless my favorite) and after reading this book I might even consider her to be a role-model. I read her other book Passion and Purity after hearing her speak a few times and was very touched by her utter devotion to Christ. This book was the same. Her commitment to God and her devotion to submitting her life to God entirely and her urge for other Christian women to do the same, is very present throughout the book. The book doesn't focus too much on her. It's a collection of her essays on topics of marriage and it contains many different love stories. Out of all the love stories I've read, the ones in this book are the most God-focused stories. The men and women in the stories mostly find marriage by giving themselves up to God. "This book does not offer a prescription for finding a life partner. Rather it presents descriptions of different ways in which God, our Guide and Guard, has worked with different people. There is no single formula for approaching marriage, but the recurrence of certain themes, methods, and timeless principles is noteworthy..."
Quest for Love really shows how suddenly and personally God directs us to a spouse. The main theme is to be patient and wait for God’s good guidance and provision, because our Lord is the only one who knows the most compatible future spouse for us. Some of the stories can appear to be completely foreign concepts to us like arranged marriage and marriage without dating. However, you can clearly see God’s hands working in all of the relationships. Ultimately when our hearts are seeking God’s will, Quest for Love really shows how suddenly and personally God directs us to a spouse. The main theme is to be patient and wait for God’s good guidance and provision, because our Lord is the only one who knows the most compatible future spouse for us. Some of the stories can appear to be completely foreign concepts to us like arranged marriage and marriage without dating. However, you can clearly see God’s hands working in all of the relationships. Ultimately when our hearts are seeking God’s will, we can be more at peace knowing that God will bring a spouse to us in his perfect timing. This book will help you see how it’s more important to work on your character and relationship with God so you would become a good helper, instead of being anxious about finding the perfect spouse. It is a bit more gear toward female readers, but I recommend it to any men and women who want to see how God works in real love stories to bring Christians together. My favorite stories are The Fear of Deprivation, The Discipline of Waiting, and Just Friends? Not quite as riveting and life-changing as the original Passion and Purity, but this still stands as a book I would recommend to someone who is wanting to bring their love life under God's control. This is also more of a sober read, because she addresses letters from individuals who have been burned in society's way of approaching love and are tentatively looking for other answers. Make sure you read the other Passion and Purity before approaching this one. If there's one thing Elisabeth Elliot doesn't do, it's pull any punches. She's quite clear about her opinions on dating, physical intimacy in romantic relationships, and the like and most of it is in complete opposition to the modern perspective on all of the above. Effectively, this is a companion book to Passion and Purity where Elisabeth uses the story of her courtship with Jim Elliot to talk about romantic relationships. In this book, she shares some more general thoughts, but it's mostly a If there's one thing Elisabeth Elliot doesn't do, it's pull any punches. She's quite clear about her opinions on dating, physical intimacy in romantic relationships, and the like and most of it is in complete opposition to the modern perspective on all of the above. Effectively, this is a companion book to Passion and Purity where Elisabeth uses the story of her courtship with Jim Elliot to talk about romantic relationships. In this book, she shares some more general thoughts, but it's mostly a collection of stories about people she knew, people she's read about, or people who've written letters to her over the years and how those people got together with their spouse or didn't ultimately end up with someone they were dating because of x, y, or z reasons. I love elements of this book for the same reason I love Passion & Purity, but so many of the stories feel much more like the exception rather than the rule. She shares a lot of stories about missionaries who had one or two interactions with a woman, proposed to her by letter, and they then got married. Now, I know the Lord works in all sorts of ways and brings people together in sometimes normal and sometimes not so normal ways, but the way she praised these kinds of anomaly type stories and almost degraded stories that are probably more normal for most of us was a bit off putting. There are some solid nuggets of truth in there, as with everything Elisabeth Elliot writes, but on the whole this was a pretty 'meh' book for me. Another thought-provoking, great book by Elisabeth Elliot. Quest for Love: True stories of Passion and Purity, kind of goes with her other book, Passion and Purity. I’ve read both and thought both were very good. Quest for Love is more stories though (as you would note in the title). –Stories of cheap romances; and stories of God-written romances. Stories of people who tossed God’s rules and warnings into the wind and did things their own way; and stories of people who carefully and committedly f Another thought-provoking, great book by Elisabeth Elliot. Quest for Love: True stories of Passion and Purity, kind of goes with her other book, Passion and Purity. I’ve read both and thought both were very good. Quest for Love is more stories though (as you would note in the title). –Stories of cheap romances; and stories of God-written romances. Stories of people who tossed God’s rules and warnings into the wind and did things their own way; and stories of people who carefully and committedly followed God’s leadings. Which one do you think ended up the best? Quest for Love explores this. Woeful and joyful letters written to Elisabeth Elliot, and stories of people from the past and such make up this book. It was very interesting and so truthful. I encourage anyone who is wondering about singleness and qualities that should be in a spouse; and anyone who is finding careless dating a problem, to read this book. This book was refreshing to read - a sharp contrast to the cheapened form of love prevalent in our society that isn't really love at all. True love involves having fun and pleasure and passion to be sure, but it's also about purity, sacrifice, hard-work, patience, respect, and the rest of the qualities mentioned in 1 Corinthians 13. That kind of love is so much more precious and persevering. God's plan for each of us, whether that means the gift of singleness or the gift of marriage, is best. If This book was refreshing to read - a sharp contrast to the cheapened form of love prevalent in our society that isn't really love at all. True love involves having fun and pleasure and passion to be sure, but it's also about purity, sacrifice, hard-work, patience, respect, and the rest of the qualities mentioned in 1 Corinthians 13. That kind of love is so much more precious and persevering. God's plan for each of us, whether that means the gift of singleness or the gift of marriage, is best. If we are meant to be married, God will guide us to the right person at the right time. If not, than our singleness is a gift for a greater purpose than marriage could have been. Read this book about 10 years ago. Never heard of it, but my fiancé handed it to me, and said, "Read this." It revolutionized my understanding of relationships. For the first time, I clearly understood my role as a man and a husband-to-be according to God's terms (according to the principles set forth in the Bible). I LOVE this book!!!! I would recommend it to any man wanting to help their relationship with their woman. AWESOME!!!!!! When I was 14, I was feeling "worried sick" about who my mate should be so I picked up this book for encouragement. Encourage me it certainly did. I came away feeling free from worry, just like that. And all because I decided to surrender my "love life" to the LORD alone to orchestrate and surprise me with. I liked this a lot. I don't think there were any ideas that I hadn't heard before but it's always helpful to hear something phrased a different way. My favorite part was reading the letters that she had received in the mail. Elliot did a nice job of teaching through the letters without hardly saying anything. Based on my perspective, this book tells about how to be woman with God's love. The author wrote her experiences since she was in school, ministry and her marriage. She put a lot of Bible's words on her book as demonstrated her faith in God. I recommend to every christian woman for reading this book. This is a good book and may lead you to be the good christian woman. This book records stories that listerners to Elisabeth Elliot's radio show wrote to her. Elliot attempts to show one how to live the godly life. The godly life extends to romantic love. She says " in every generation there are those who not only hunger for the truth, but also search desparately for a high, even an 'impossibly' high standard." This is a neat book with all kinds of stories of those who have taken the wrong road in the "dating culture" and have gotten hurt and the stories of those who have done it the "right" way and have been blessed! It is very encouraging and inspiring! Elisabeth offers empathetic wisdom throughout. Bring your "love life" under the authority of Jesus Christ. Full of true life stories of Passion and Purity. I highly recommend this Biblically based book to anyone over the age of 15. I love Elisabeth Eliot, but this book goes a little too much into her specific "rules" for relationships, which I don't always agree with. The points she makes are excellent, it just borders a little on legalism at places. I found a great deal of insight and yet was a bit concerned with the influence Elizabeth has over younger women who may think such unchaperoned courtships maybe viable. Elizabeth warns about this but the book could have made it clearer by the choice of examples. Filled with diverse stories and down-to-earth wisdom. Elisabeth Elliot shows that there is no formula. God is our focus and the center of any true relationship. We should be running after and trusting in Him! This book was a breath of fresh air to the Passion & Purity ideas after the sterility of the original book. While Elliot's story seemed very rigid, these stories were more vibrant, real, relatable. I would recommend this book over the original. I appreciated the point of view that abstinence before marriage is important. It tells of many people's experiences as they wish to be married to someone who shares their commitment to religious principles and practices. A very remarkable book containing practical principles on marriage, dating, a blibical view of the present trends and the western culture in the matter. The solution to your quest: total surrender to God and His almighty and all-knowing plan for you and your life on earth. Totally worth reading! One of the best books I’ve ever read on the subject of love between a man and a woman and how to let God be in control of our “love life”. It doesn’t offer pat solutions but causes one to really think and approach relationships God’s way. Another excellent book from Elisabeth Elliot. This is better than its companion book, "Passion and Purity" because it gives a variety of stories that support chastity before marriage, and a Christ-centered life. Great reflection questions at the end of each chapter. Better if all the chapters included at least one story. From the Author's Web Site: My parents were missionaries in Belgium where I was born. When I was a few months old, we came to the U.S. and lived in Germantown, not far from Philadelphia, where my father became an editor of the Sunday School Times. Some of my contemporaries may remember the publication which was used by hundreds of churches for their weekly unified Sunday School teaching materials. From the Author's Web Site: My parents were missionaries in Belgium where I was born. When I was a few months old, we came to the U.S. and lived in Germantown, not far from Philadelphia, where my father became an editor of the Sunday School Times. Some of my contemporaries may remember the publication which was used by hundreds of churches for their weekly unified Sunday School teaching materials. Our family continued to live in Philadelphia and then in New Jersey until I left home to attend Wheaton College. By that time, the family had increased to four brothers and one sister. My studies in classical Greek would one day enable me to work in the area of unwritten languages to develop a form of writing. A year after I went to Ecuador, Jim Elliot, whom I had met at Wheaton, also entered tribal areas with the Quichua Indians. In nineteen fifty three we were married in the city of Quito and continued our work together. Jim had always hoped to have the opportunity to enter the territory of an unreached tribe. The Aucas were in that category -- a fierce group whom no one had succeeded in meeting without being killed. After the discovery of their whereabouts, Jim and four other missionaries entered Auca territory. After a friendly contact with three of the tribe, they were speared to death. Our daughter Valerie was 10 months old when Jim was killed. I continued working with the Quichua Indians when, through a remarkable providence, I met two Auca women who lived with me for one year. They were the key to my going in to live with the tribe that had killed the five missionaries. I remained there for two years. After having worked for two years with the Aucas, I returned to the Quichua work and remained there until 1963 when Valerie and I returned to the U.S. Since then, my life has been one of writing and speaking. It also included, in 1969, a marriage to Addison Leitch, professor of theology at Gordon Conwell Seminary in Massachusetts. He died in 1973. After his death I had two lodgers in my home. One of them married my daughter, the other one, Lars Gren, married me. Since then we have worked together.